I COMBINE SHIPPING WHENEVER POSSIBLE BY TOTAL WEIGHT 1 oz ROSE GERANIUM ESSENTIAL OIL Species: Pelargonium graveolens L'Herit. ex Ait., fam. Geraniaceae Part: Leaf Method: Steam distillation Class: Monterpene alcohol Country: Egypt Overall Scent : Fresh, sweet, rosey and powerful. Floral-minty and green, latin botanical name pelargonium graveolens, has distinct rosy aroma. Oil Properties: Properties of include balancing, warming and lifting of emotions. This oil is also very helpful to lift sadness and depression as well as stress and anxiety. The oil is reputed to have healing properties to aid in relief of circulatory disorders, bleeding ulcers, hemorrhoids and herpes due to its Homeostatic and antiviral qualities. Wonderful as a skin or hair care ingredient, as Rose Geranium oil helps clear acne, exfoliates dull skin, and controls oily skin. This oil is also known to benefit sufferers of eczema, shingles, and itchy dry skin. 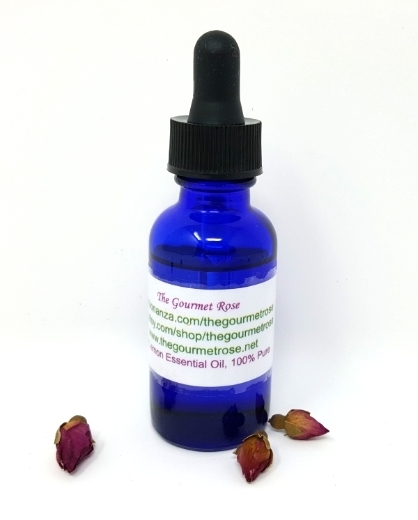 Rose Geranium Oil Blends well with: Flower Oils: Chamomile oil, Lavender oil, Clary Sage Wood Oils: Cedarwood Herb Oils: Rosemary oil, Basil Oil, Palmarosa Oil One of the most popular essential oils, your fragrance selection won't be complete without Rose Geranium Oil. MMM....The Smell of roses. PERFECT FOR HANDMADE SOAPS, AROMATHERAPY SO MUCH MORE! ADD TO HANDMADE SOAPS, BODY BUTTER, MASSAGE OILS, LOTIONS, LIQUID SOAPS, SUGAR SCRUBS, AND MORE! REMEMBER IT IS 100% NATURAL!